Place the butter, cacao, maple and milk in a medium heatproof jug. Place in the microwave on high for 30 seconds. Remove the jug from the microwave and, using a fork, whisk the mixture until it’s smooth. Break the egg into the jug and add the almond meal and vanilla. Whisk again until it’s all combined. 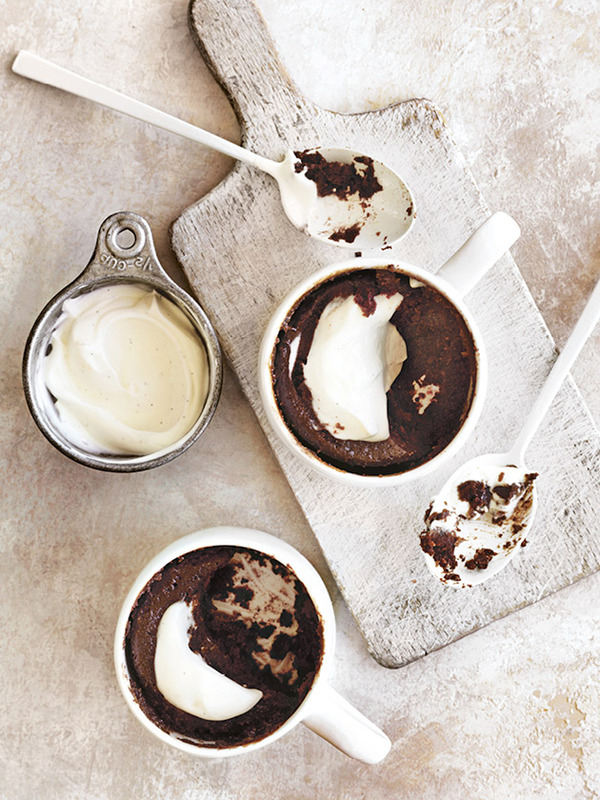 Divide the mixture between 2 small microwave-safe mugs or ramekins. Place both mugs in the microwave on high for 1 minute 20 seconds or until the puddings are set around the edges but still a bit wobbly in the middle. Cups with metallic details don’t mix well with microwaves. Plain ceramic mugs are a good option. If you’re not sure if a mug is microwave-safe, just check with a grown-up.